THE FUTURE OF WORK: 4 MAJOR TRENDS AT NEOCON 2017 - As always, the future of the office will play a major role at the 2017 edition of NeoCon. SPECIAL EVENTS - NeoCon is three days of nonstop special events and parties. FLOOR PLANS - Don't get lost in theMART. Also don't forget about theMART's neighborhood showrooms. 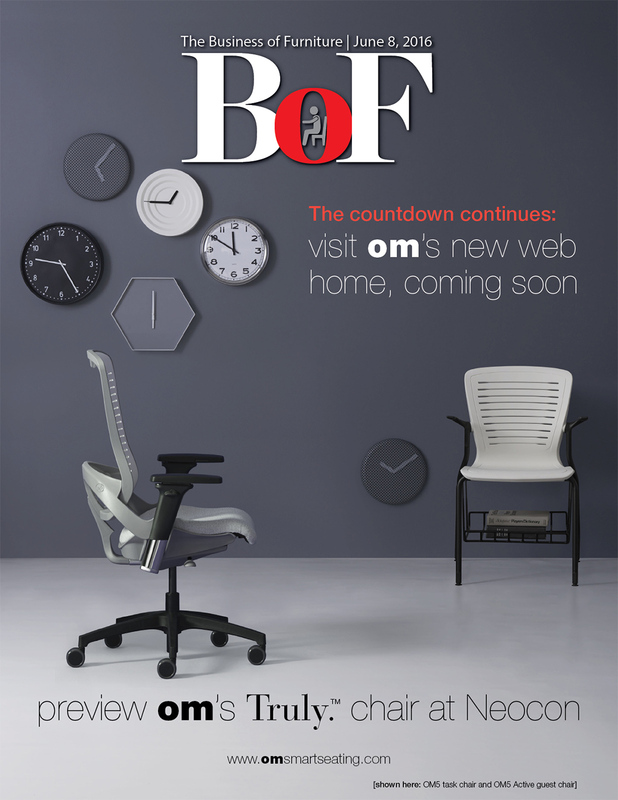 THE BEST AND BRIGHTEST PRODUCTS DEBUTING DURING NEOCON - Hundreds of the latest products to stop by and see. THE COMPANIES - The Latest Products and Introductions at The Show: - 3form, 9to5 Seating, AIS, Allsteel, Arcadia, Arc-Com, Arper, Artopex, Barbican, Bentley, Boss Design, Brentano, Bush Business Furniture, BuzziSpace, Camira, Carnegie, CF Stinson, Chilewich, Clarus Glassboards, Coalesse, Concertex, Configura, Dauphin, Davis, DesignTex, Dyson, Egan, Encore, Enwork, ESI, Falcon, Flexsteel, Formaspace, Frem, Garrett Leather, Geiger, Ghent, Global, Great Openings, Groupe Lacasse, Gunlocke, HBF, Herman Miller, HON, HPFI, Humanscale, ICF, Indiana Furniture, Inscape, Integra, izzy+, J+J Flooring, Jabbrrbox, JRB Studio, JSI, Keilhauer, KFI, KI, Kimball Office, KnollTextiles, Koleksiyon, Loctek, LOFTWall, LOGICDATA, LightCorp, Luum, Maars Living Walls, Mayline, Mohawk Group, Momentum, Muzo, National Office Furniture, Nemschoff, Nienkamper, Nightingale, Nucraft, Nxtwall, Okamura, OM, Pallas, SitOnIt, Sixinch, Spec Furniture, Steelcase, Steelcase Health, Studio TK, Stylex, Symbiote, Teknion, Thonet, Trendway, Tuohy, unika vaev, Versteel, Via Seating, Vitra, Waddell, West Elm, Wilkhahn, Wolf-Gordon, Workrite - AND MORE! 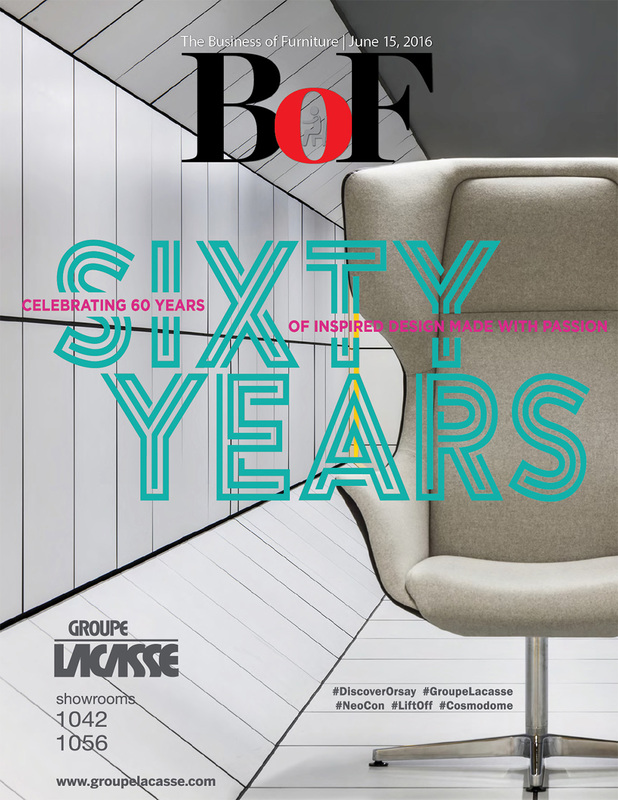 Pre NeoCon Weekly Issue - Over 111 Pages of Content! Feature - UPFRONT: What time is it? NeoCon Time! Industry Portfolio - A look at how our office furniture manufacturing rich stock portfolio is doing this week. Hutch - Our weekly industry centered cartoon of thought and reason. Major Events - A preview of the upcoming large industry events. Industry Events - Looking to attend an industry function this year? We've compiled a complete list of what's happening. The Stream - A curated look around the web at this week's most compelling articles and blogs. Industry Pulse - Late-breaking news and career changes in the industry. Industry Classifieds - The Global Marketplace for workplace furniture goods and services. Industry Careers - The Global Marketplace for top workplace furniture talent. 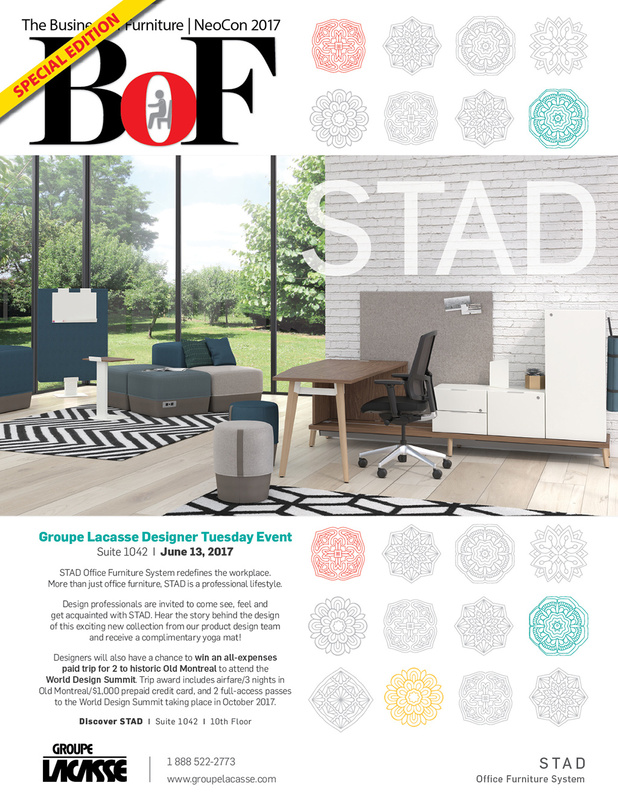 WORKPLACES OF THE FUTURE DEFINED AT NEOCON - While you were working, office furniture makers and sellers, interior designers and the folks who create your workplaces gathered last month in Chicago to talk about how you'll work in the future and the products that will make it happen. PERSPECTIVES - Productivity is often brought up when talking about efficiency, or lack thereof, in the workplace. However, this topic of productivity might be more, well…productive if the conversation shifted to the notion of time itself. What seems to be a fixed convention can be interpreted differently depending on an individual's cultural view of time. The field of study around this topic is called Chronemics. INCLUSIVENESS IN THE WORKPLACE: BE TRU TO YOURSELF - It's been a landmark year for 30-year-old Tru Jonkman. After living his whole life being known as a female, he made a life-changing decision recently to transition to a male identity. Jonkman, who has worked in the seating plant at Herman Miller in Holland, Michigan, since 2014, had been thinking about transitioning to a male for some time. COWORKING AND WORKING OUT GO HAND-IN-HAND IN NYC - The concept behind the coworking facility Primary is that businesses and individuals prosper from convenient access to wellness. Believing that people work best when they feel good, the company uses a three-prong approach to achieve it: 1) by providing the physical workspace to enhance it; 2) fostering and supporting the community that's there; and 3) offering healthy amenities and benefits at every turn. CAN OFFICE DESIGN SOLVE OBESITY? - For anyone who follows workplace trends, it's no secret health and wellness are becoming all the rage when it comes to designing for the built environment. As a society, we have turned the corner from looking at sustainability as something inherent in a building (LEED) to extending that sustainability story to "human" sustainability. HOW 3D PRINTING IS CHANGING THE WAY YOU WORK - Intricately carved chairs, serpentine tables and elaborate lamp shades – these creative pieces were once the digital doodles of furniture designers with little hope of a life beyond a computer file. But the rise of 3D printing can now bring these designs to life with startlingly precision. Known as additive manufacturing, this technology is more than a way to push aesthetics past traditional limits. PRODUCT MATTERS - The dry erase marker may be a small accessory for the office, conference or training room, but it is one of those items that when you need it, it is very important. That's happening a lot more than it used to as whiteboards find their way out of conference or training rooms and spread throughout the workplace. The ones on wheels can be moved around for impromptu collaboration or at individual work stations. A NEW ERA OF COWORKING - The coworking revolution is transforming real estate. Pioneered by start-ups, entrepreneurs and freelancers, a growing number of companies, large and small, are exploring how to incorporate the concept. ENDMATTER - 10 Workspace Features that Millennials and Gen Z want. / One of the Top Workplaces to Work: One Workplace in the Bay Area/ Also: Pay $4K To Work In a Coworking Temple to Yves Béhar's Design. DEALER DIRECTORY - North America's best office furniture dealers. Live From NeoCon Chicago - Still one more day left! Feature - UPFRONT: NeoCon in Full Swing in Chicago! 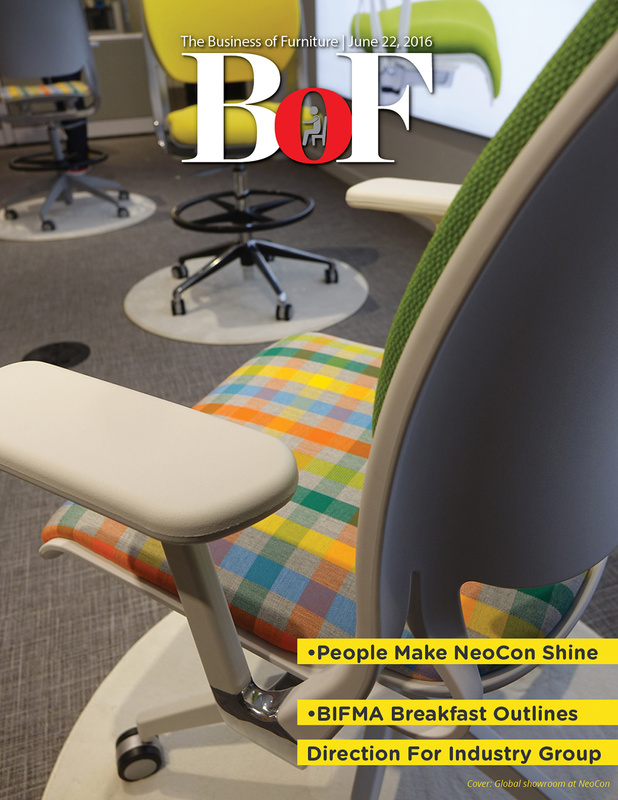 UPFRONT: People Make NeoCon Shine - Many who attend NeoCon mistakenly see it as a product show. I've been to enough of them to recognize it as a people show. The real value of NeoCon is found in the connections made, dinners shared and friendships rekindled. BIFMA Breakfast Outlines Direction For Industry Trade Group - BIFMA Executive Director Tom Reardon outlined how the group can be more relevant, including participation in its revamped statistics program. With NeoCon Done, Time to Think of Orgatec - The show, which runs from Oct. 25-29 in Cologne, always has a theme and this year, Orgatec will tackle "New Visions of Work" and "Creativity".